The tents of an invading army of Hobbits? The emergency accommodation put up to welcome the army of Romanian guest-workers our idiot government are trying to convince us are about to descend? 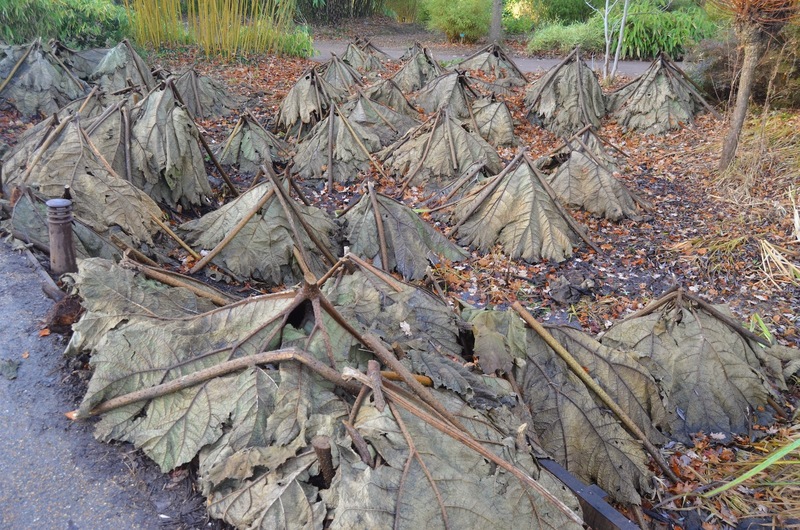 No, the leaves of Gunnera manicata all heaped up by Wisley staff to protect the crowns. Just in case we have a hard winter. 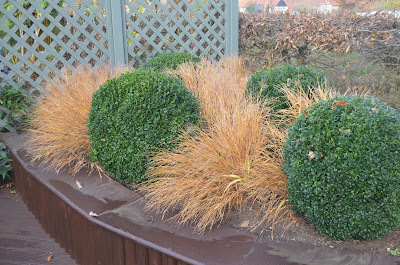 I was down at the RHS garden in Surrey last week to do some work in the library and had a quick look around the garden. So far we have hardly had temperatures below freezing, and I have never known trees hang on to their leaves so close to Christmas. It really feels like a phoney winter. The inner part of the seed cases of Lunaria rediviva. One of the best seedhead plants. Fruit - mini-apples, on Malus hupehensis. Berries/fruit and seedheads are the classic elements of the early winter garden, now joined of course by seedheads and grasses. This stroll around Wisley however is a reminder of how green winter can be, especially if temperatures do not dip too much. A good opportunity to reflect on just what sort of a climate we have and how that impacts on plant selection. You see, for some time, I have realised the rather counter-intuitive notion that we have more in common with a Mediterranean climate than a continental one even though most of our garden plants are from regions with the latter climate. Mediterranean winters are cool and wet, a bit like ours are a lot of the time, even before the current run of mild winters started in the 1980s. 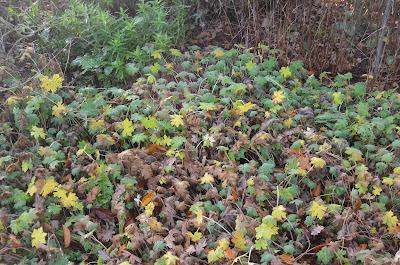 We can have the luxury of green foliage for quite a lot of our winters as a result. Things like Acanthus mollis, Mediterranean perennials which make a great leafy show right now. The paradox is that many (all?) 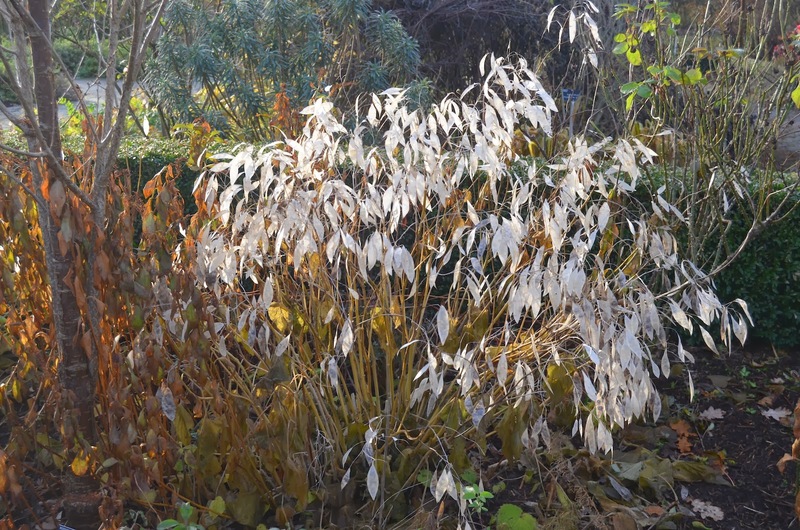 Mediterranean plants will make active growth at lower temperatures than those from continental climates - the risk of growth being zapped by hard frosts is low. 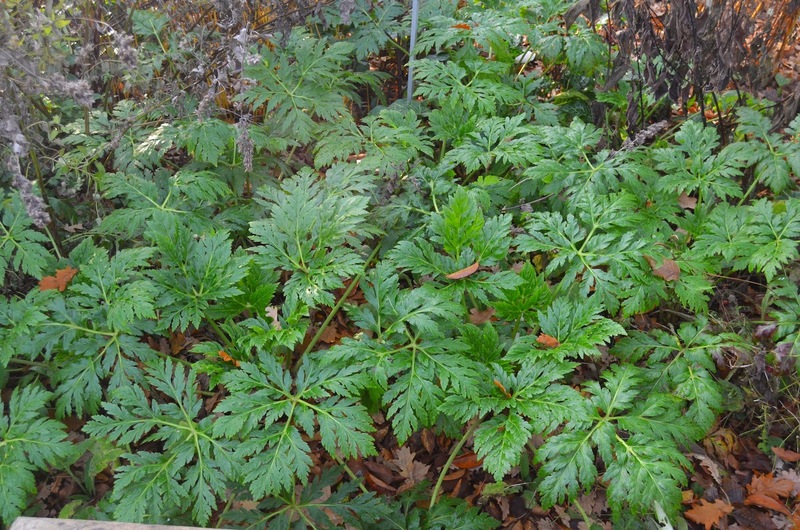 A walk around a garden now can tell you a lot about what climate zones plants are from. 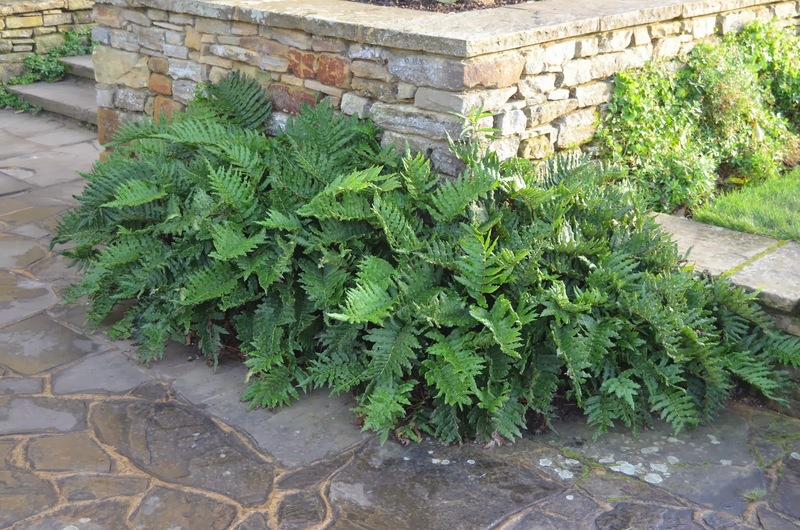 Blechnum chilense, a Chilean fern also used to mild winters. 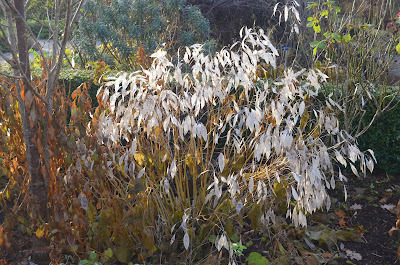 A great winter foliage plant if you can get away with it. Geranium palmatum, from the Canaries. We can do well with these plants from the middle Atlantic Isles, with their moderate climates, not too cold or hot. 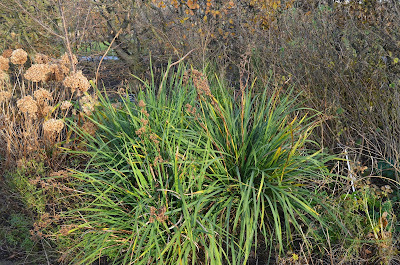 And a libertia - foliage still fresh and green - indeed evergreen in most winters. From Chile and New Zealand - again that moderate, equable, climate. 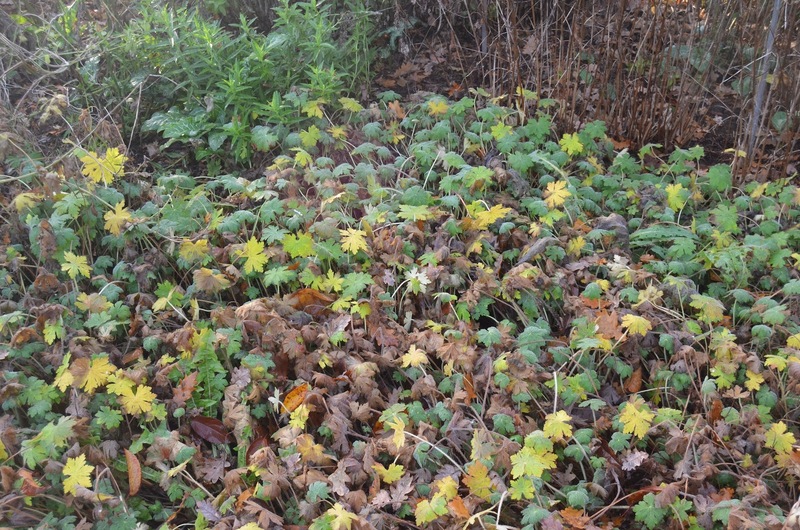 Looking a bit ropey, but not completly dormant, Gerananium macrorrhizum from the Balkans, an area which gets cold winters and a lot of snow but which sometimes has milder spells, so it helps being able to photosynthesise in warmer periods. A nepeta (catmint), another genus with quite a few from the Mediterranean. 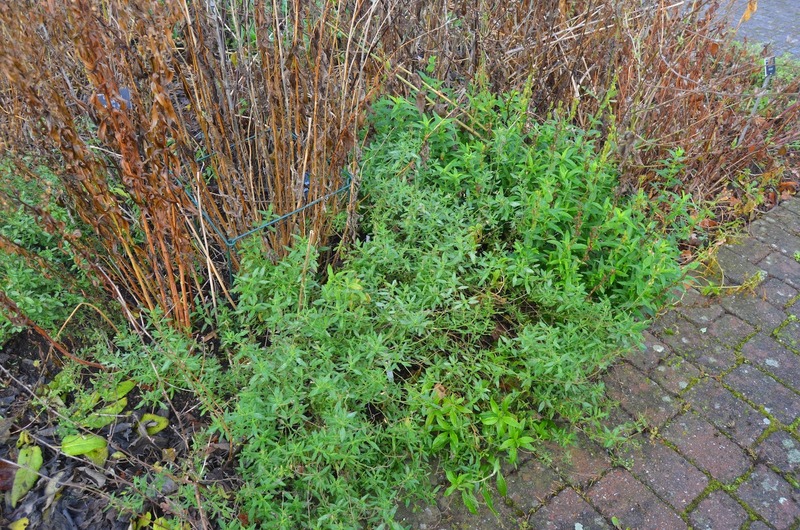 We tend to think of plants from the Med as being not hardy, but much of the region gets occasional severe winters, especially the eastern part when cold air masses can come down from Russia and central Asia via Turkey. Now, the borders which Piet Oudolf designed in 2000, looking fantastic right now, but hardly any green. These are plants from continental climates for the most part; for their own protection they have to totally shut down for the winter, and not come out of hibernation until temperatures are relatively warm which means all danger of frost is past. I find these grass, seedhead combinations incredibly beautiful, all the more so for their stark contrast to the amount of green elsewhere at this time of year in a garden like Wisley. 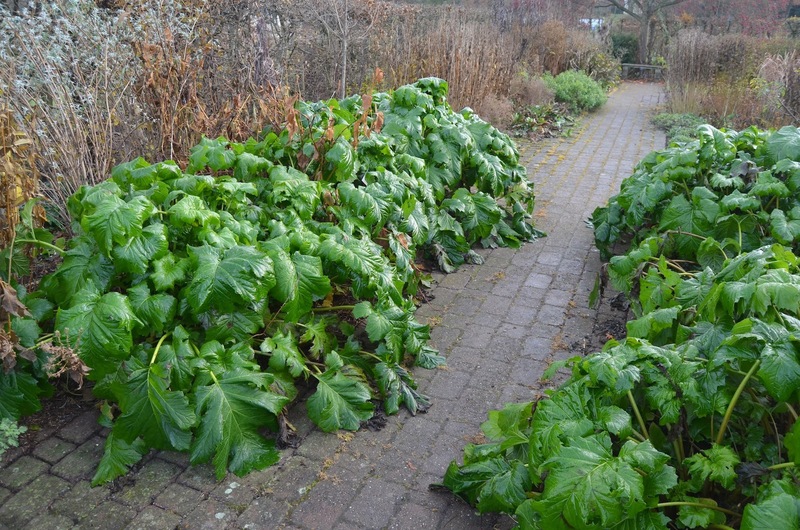 certain people on the RHS General Council have expressed disatisfaction with the way things are maintained here too "they just don't seem to get it" she said. And new plants - such as Pennisetum macrourum, a South African species with nice heads but an aggressive spreader. Didn't anybody know that once this plant is in, it will run and run and completely blur whats left of the design? Good plant - wrong place. One of many South Africans that seem to be doing very well here, like the Diearamas that seed madly in my own garden. 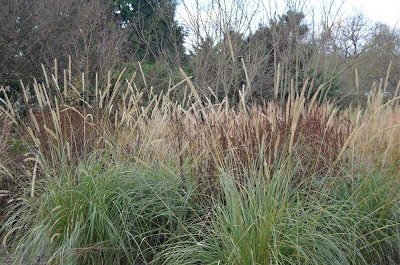 Box and grasses - I think this was Anemanthele lessoniana - don't they look good together? Surprised you don't see this more often, very much the old and the new together. Again, box and most other evergreen broadleaves are part of that flora of 'Atlantic' Europe (actually we should include north-west Africa in here too) , plants of mildish winters, species of the western Mediterranean, hardy enough in normal circumstances but not so capable of taking the constant very cold winters of central Europe. Ivy is another one, the semi-evergreen bramble another. 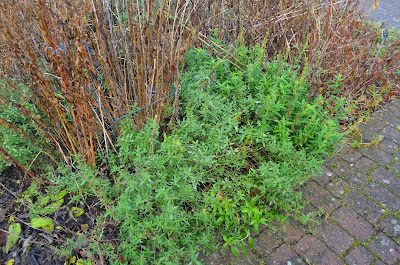 Being aware of all this winter greenery gives me a strong sense of geographically where we are, on the fringe of Europe, with connections to all those other places our plants come from where winters are mild and occasions to grow (albeit fitfully) rather than hunker down and hibernate. 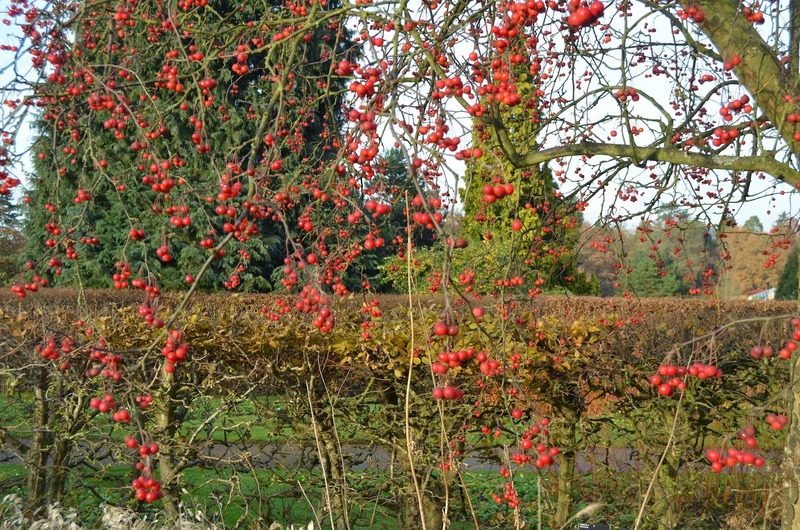 Having 'the holly and the ivy' is something of a luxury for us, living where we are. A green element in our gardens I wouldn't want to live without. 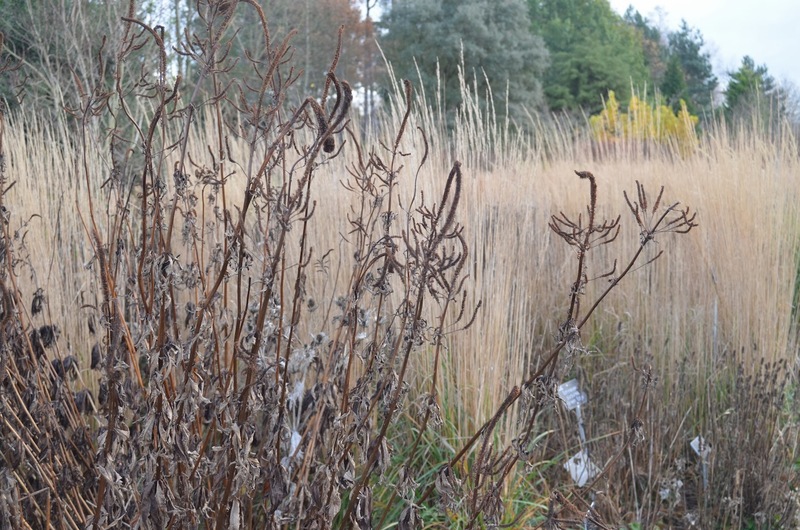 Two updates: one on the EU proposed legislation on plant cultivars, and the other on the perennial meadow at Hummelo. Miscanthus 'Yaku-jima', in our garden last week, a good small miscanthus, but still growing a lot bigger than it does with many - that high level of phosphorus in the soil i suppose! First, I've had detailed responses from two UK Members of the European Parliament, who are very well aware of this issue, and trying to change it. Thank you to Julie Girling and Anthea McIntyre. I have also been in correspondence with Dutch nurseryman Coen Jansen who writes: “Since the article in "The Garden" and yours in the newspaper, things are changing here too: after your article I received a mail from a rather worried Belgian nurserywoman, who had read your article, and she also asked her MP what is going on really. He answered that a lot of MP's are working on it, asking mainly for exceptions for small nurseries with a turnover under € 2 million a year, and/or for nurseries employing less than 10 people. Secondly, Piet Oudolf's meadow - the mystery deepens. Piet and Anja are back from their trip to visit their son and family in Ecuador, and Piet has corrected me on the soil below the wonderful perennial planting featured in my last posting. It is actually soil, NOT sand, some soil was actually imported to make up the ground here, although it looks very sandy and has a high sand content. I have been comparing annual weather statistics between Arnhem and Hereford too, not much difference: Arnhem region has a more continental climate (i.e. warmer summer and colder winter) but there is not much in it, and they have quite a lot less rain, maybe 50% less, but still around 1000mm a year. The more continental the climate, the more that forbs (flowering perennials) are competitive vis a vis grasses. The answer may still lie in the soil. This article here by Ken Thompson points out the importance of phosphorus in determining wildflower diversity. I know we have a very high level of this plant nutrient, as indeed do many soils in Britain. Next time I go to Hummelo, a soil testing kit goes with me.